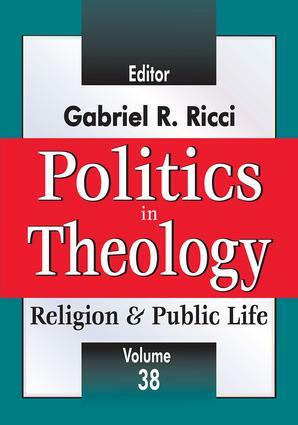 This new volume examines the relationship between religion and politics from a historical perspective. Contributors address specific moments in which political governance intersects with religious ideals in dramatic ways. These moments question the relationship between religious sentiments and political solutions and threaten to reorder the geopolitical landscape. These essays discuss the tensions produced by secularism in an Islamic culture, the influence of Catholic theology in workers' political movements, and how Hinduism has been transformed by the political process. Also featured are essays that emphasize how civil religion coincides with constitutional order, and how the drama of religious tolerance and legitimization of the power of Christian hierarchy originated in the political power of the Roman emperor. This volume is an interdisciplinary effort from up-and-coming and cutting-edge scholars. Contents include: "Something as Yet Unfinished," Adam Stauffer; "Carl Schmitt, Leo Strauss, and the Necessity of Political Theology," Grant N. Havers; "Escape from Theology," Peter Grosvenor; "The Persistence of Civil Religion in Modern Canada," John von Heyking; "The Politicization of Hinduism and the Hinduization of Politics," Jeffery D. Long; "Ontology, Plurality, and Roman Catholic Social Teaching," Roland Boer; "The Pseudo-Isidorian Decretals and Church-State Conflict," Mary Sommar; "Thomas Aquinas on Providence, Prudence, and Natural Law," Christopher S. Morrissey; "The Mystical Body of Christ and French Catholic Action, 1926-1949," W. Brian Newsome; and "Secularism in Turkey," Oya Dursun-Ozkanca.